The Bank of England’s (BOE) policymakers warn of heightened risks to the UK’s financial stability amid the ongoing Brexit process and an uncertain outlook with respect to capital flows and domestic investment, suggesting the central bank will delay its expected interest rate hike until at least May. 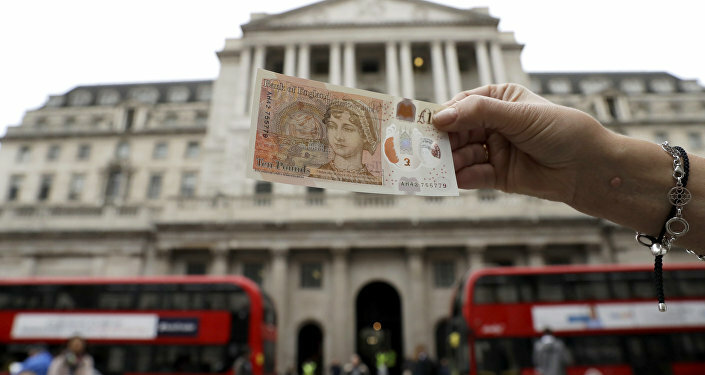 Kristian Rouz — Bank of England (BOE) policymakers say the tumultuous Brexit process still poses risks to the UK's economy despite signs of an adjustment to the high-volatility environment that has prevailed since the June 2016 referendum. The central bank's Monetary Policy Committee (MPC) members are set to meet this week to discuss a path forward amid the recent developments in the national economy. BOE policymakers have also warned commercial lenders against loose underwriting standards in mortgages and several other types of credit products. They say excessive loan issuance could jeopardize the entire British financial system due to the uncertainty in capital flows and challenges to bank capitalization, stemming from the volatility that has accompanied the Brexit process. The upcoming MPC meeting is expected to demonstrate a visible shift towards tightening monetary conditions in the UK, partially, as a reaction to the US Federal Reserve's continued course of interest rate hikes. Higher rates could also curb the issuance of bank loans to potentially insolvent borrowers, thus increasing the overall financial sector's sustainability, albeit at the cost of slower economic growth.The BOE is set to address the elevated inflation risks, fueled by the gains in imports prices, which, in turn, stem from the looming disruptions in international trade and the UK's separation from the single European market. "The MPC will be keen to at the very least preserve, and possibly raise, market pricing for interest-rate rises," George Buckley of the financial services company Nomura Holdings said. "We doubt the bank will need to go as far as it did in September, when it felt forced to ‘hand-hold' the market through a November rate rise." The MPC is meeting Thursday, are is set to vote 9-to-0 to keep the BOE's benchmark interest rates at their current level of 0.5 percent — compared to the current US Fed rates of 1.25-1.5 percent. The decision will provide some temporary support for British domestic lending, while the expected rate hike in May will arrive just in time to stave off potential further increases in inflation. UK's inflation is estimated at 2.8 percent year-on-year — far above the BOE's 2-percent target, yet still below its peak of 3-percent several weeks ago. Experts also say the BOE could undertake up to two 0.25-percent interest rate hikes by next June, bringing benchmark interest rates to 1.0 by mid-2019. Such estimates are very preliminary, however, as the course of monetary policy will largely be determined by the shift in international trade, the type of Brexit deal — if any — achieved by London and Brussels by March 2019, as well as the pace of British GDP growth over the coming year. Additionally, the BOE's Financial Policy Committee (FPC) said in a statement last week that the Brexit process might cause disruptions to the UK's domestic financial stability. "Material risks remain, particularly in areas where actions would be needed by both the UK and EU authorities," the FPC warned. According to the BOE experts, the main risk area is the UK-EU clearing of outstanding international contracts. They say Brexit could disrupt the industry, which is worth approximately $36 trln in uncleared contracts, and another almost $100 trln in processed contracts. These contracts represent the exchange in financial assets and services between the UK and the EU, mainly, between the London Stock Exchange (LSE) and Börse Frankfurt. Additionally, BOE policymakers said, the insurance industry could be at risk of losing revenues if uncertainty in the ongoing Brexit process lingers for several more months. The total amount of liabilities could reach as much as $116 bln in a worst case scenario, FPC analysts said. In order to curb financial risks, the BOE is reportedly increasingly convinced it should undertake an interest rate hike, which could lift the sterling's FX rate, and attract additional capital — including investment — into the UK. Meanwhile, the FPC stress-tests have shown base borrowing costs could go up to 4 percent in the near-term, causing only a 33-percent plunge in home prices, which are currently prohibitively high — particularly in the English Southeast. The MPC, however, is expected to proceed cautiously, adjusting interest rates gradually, based off the macroeconomic data. Several fresh macro reports will arrive this week prior to the MPC's meeting, shedding more light on the Committee's upcoming decisions.